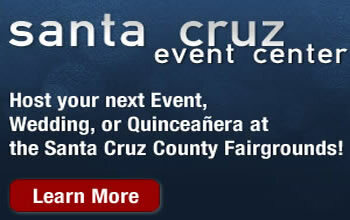 The Santa Cruz County Fair begins Tuesday September 11th at noon. An Opening Ceremony will kick off the Fair at 11:50 am at the Rodgers House, followed by the Farm Bureau BBQ in Paddy Smith Park. Opening day is also Senior Day sponsored by Rabobank. Seniors will be able to get discount admission as well as a Free Ice Cream Social starting at 12:30 pm and the Third Annual Senior Contest at 1:00 pm. Fairgoers of all ages will enjoy fun attractions that include the All Alaskan Racing Pigs, Circus Imagination, Sea Lion Encounters and Hypnotist Michael Mezmer. Check the online or Fair Guide schedule for show times. The All Alaska Racing Pigs in particular have been coming to the Santa Cruz County Fair since 1988. Their shows combine comedy and competition, as the little pigs race as fast as they can to the finish line on Livestock Lawn. Be sure to watch to see which porker tries to hog the limelight in the races on opening day. The start of the Fair also brings back favorites such as the funny Fables of the West and Mariachi de California, as they entertain crowds around the Fairgrounds. Exhibits in Yesterday’s Farm such as spinning, antique tractors and cars, draft horses, woodcarving and more will have continuous demonstrations. The nighttime entertainment will feature Divas of the Decades, a bay area duo that specialize in songs that pay tribute to the female voices of pop and rock from the ages. The Divas will take to the Amphitheater Stage at 7:30 pm. The Fair will take place September 11 to 16 at the Santa Cruz County Fairgrounds in Watsonville. The Fair runs from Noon to 10 p.m. on Tuesday, Noon to 11:00 pm Wednesday through Friday, and opens at 10:00 am Saturday and Sunday. Admission at the gate is $10 for adults, $5 for children, and $6 for seniors. Parking is $5 at the Fairgrounds. More information and schedules can be found at santacruzcountyfair.com.